You can manage all your account settings, such as your profile photo and name, language of the interface, time zone, and password, within the Settings pane. From the Navigation tab, choose Settings. Click your account photo at the top right corner of the page and choose Settings. Personal info block contains your account details, such as profile photo, name, and email. Profile photo. You can add, change, and delete your profile photo. Hover over the circle and click + Add photo to add your profile photo. To delete or replace it, hover over the photo and click the pencil icon to replace the current photo, or click the trash icon to delete it. First name and Last name. You can change your name whenever you need. Email. You are not able to edit your account email. To change it, please contact us at help@slemma.com and we’ll be happy to take care of it for you. Don’t forget to click SAVE CHANGES at the bottom of the Settings form after you have made changes. Within the Language and settings block you can easily manage the language of the interface and your time zone. Language. English and Russian languages of the interface are available. Time zone. The standard set of time zones is available. Advanced settings enable you to customize your region parameters. 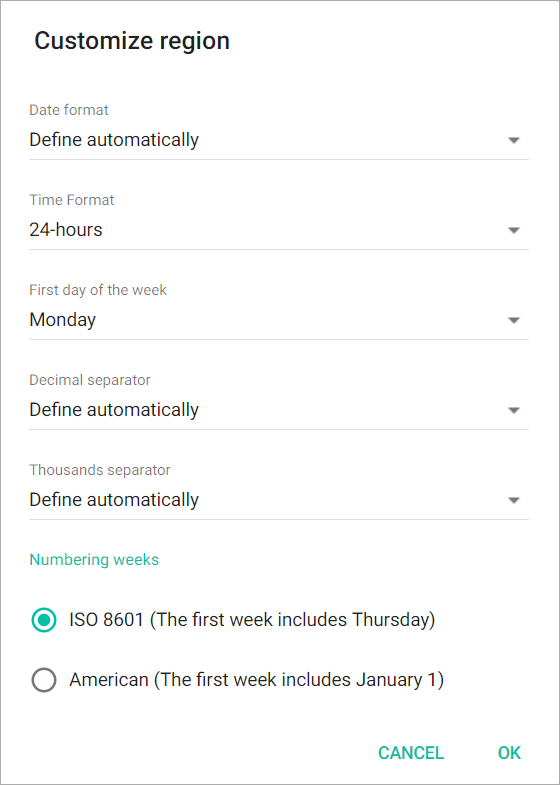 Within the Advanced section you are able to set the date and time format, choose a day of the week that will be defined as the first day of the week, customize decimal and thousand separators, and set weeks numbering. Define automatically. The date format will set automatically according to the default settings for your location (time zone). You can choose any day of the week as the first day of the week within Slemma. Monday is set as the first day of the week by default. Under Decimal separator drop-down menu you can choose how a decimal point will be represented. Define automatically. The decimal separator will set automatically according to the default settings of decimal separator for your time zone. Default settings are a dot for English language of the interface and a comma for Russian one, or dot for US and comma for Europe. Dot “.” Decimal separator is represented as a dot (123.45). Comma “,” Decimal separator is represented as a comma (123,45). Under Thousands separator drop-down menu you can choose how a thousand point will be represented. Define automatically. The thousands separator will set automatically according to the default settings of thousands separator for your time zone. Default settings are comma for English language of the interface and space for Russian one, or comma for US and space for Europe. Space. Thousands separator is represented as an empty space (123 456). Dot “.” Thousands separator is represented as a dot (123.456). Colmma “,” Thousands separator is represented as a comma (123,456). You can choose one of the standards for weeks numbering. ISO 8601 (The first week includes Thursday). The first week of the year includes the first Thursday of the year, the second week starts from the next Monday (set by default for Russian language of the interface). American (The first week includes January 1). The first week of the year starts from January 1, the second week starts from the first Sunday (set by default for English language of the interface). If you need to change a password, you have to enter your current password to the Current text box and the new one to the New and Confirm boxes. After that, click SAVE CHANGES button at the bottom of the window. Click Delete account at the bottom of the pane if you want to delete your account. You will get the dialog window to confirm your actions. Click OK.
All the objects that you created and shared within the Team will still be available for your team members, so they will be able to open, edit, share, and delete the objects depending on their permissions. However, they will not have access to your private data sources such as your Google Drive. If you decide to come back to us one day, you will be able to recover your account. To recover your account, please contact us at help@slemma.com and we will be happy to take care of that for you!